Discard all the cards in your hand. Draw the same amount of cards discarded this way plus one. Then gain life equal to the number of cards in your hand. Finale Of Glory, woof. Pull that in your draft and basically try to stay survive to cast it. At first I read it as making Angels INSTEAD of Soldiers if X = 10+. Nope, it's make BOTH equal to X. Good lord. I was thinking of a Soldier + Angel deck recently with the Elspeth walkers and things like Divine Visitation and Cathars' Crusade. Finale Of Glory is definitely making the hamster wheel in my head spin for this deck. Mainly play Casual Multiplayer and EDH. Whenever you cast a creature spell, create a 4/4 black Zombie Warrior token with vigilance. That card will do some work in a few decks of mine...if only I had a creature heavy white deck. 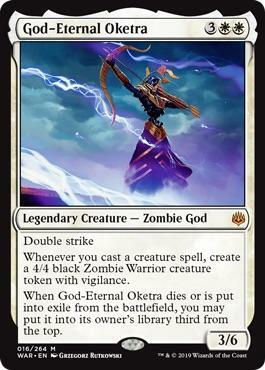 I already thinking about adding her into my Najeela warrior tribe deck.